Worldwide, over 50 million people have dementia. That number is projected to increase by 10 million every year. Those with dementia or other cognitive impairments greatly benefit from various forms of creative therapy. One of the most common, and beneficial, is art therapy. Art therapy offers those with dementia a sense of self-expression, accomplishment, and even purpose. 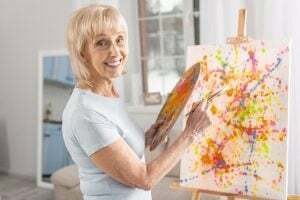 Studies has shown that when those with dementia take part in various creative therapies, like art therapy, numerous cognitive improvements are made. When you couple art therapy with the benefits of music, conversation, praise, and positive encouragement, those with dementia have been shown to have increased positive mood, outlook, and overall life satisfaction. Art therapy can actually trigger dormant memories, encourage conversation, and can stimulate the senses. Those that have lost the ability to hold a conversation, in some cases, have been shown to have some restored speech and abilities. The reason behind this is because the part of the brain where creativity is centered is in a different area than language. This can force the brain to rewire itself. While the results vary, and by no means is art therapy a cure, it can bring relief to those with dementia and hope to those that care for those with dementia. Realistically, any activity that is creative can be beneficial. However, not everyone has the artist’s mind and can simply come up with ideas. So, we’ve complied some very good activities for you to get you started. One of the key things to remember when doing an art therapy activity is to keep it adult-focused. Making an activity child-like will likely upset the person with dementia. Creative Coloring – Adult coloring is all the rage these days, with adult coloring books featured on many bookshelves in stores around the country. These coloring books have intricate designs that can vary in skill level and intensity. The amount of these coloring books allows for a lot of various styles and topics as well. If your loved one really like animals, chances are you’ll be able to find an adult coloring book that is animal focused. Pair the person’s likes with the type of book to make it extra special. Using colored pencils is the recommended medium, although colored markers are also sufficient. Avoid crayons as they are too blunt for some of the intricate details. Beading – Beads are very inexpensive and can offer dozens and dozens of different things to make. You could make jewelry, a hanging decoration, and much more. You could even take small seashells and string them together to make a sort of wind chime, without the chime part of course. Paper Crafts – This can be a fun way to make things like cards or a scrapbook. Get some nice stylized paper and cut out various shapes. Then, glue on things like ribbon or place on self-adhesive jewels. The sky is the limit and things like these make great gifts. Jigsaw Puzzles – While not considered a traditional art form, jigsaw puzzles use the same part of the brain as artistry, and therefore qualify as a type of art therapy. It takes a high level of brainwork to manipulate each puzzle piece, place it in the correct position, and thus produce a photo that is representative of the final photo. These are quite inexpensive and can be found at almost any store. Art therapy is a great way to get the creative juices flowing while also helping to improve the lives of those with dementia or other cognitive impairments. At Bonaventure Senior Living communities, we do art therapy in our memory care units on a daily basis. Not only does it provide the mental benefits discussed above, it also provides an extra layer of socialization. We hope you have found this to be both informative and inspiring.